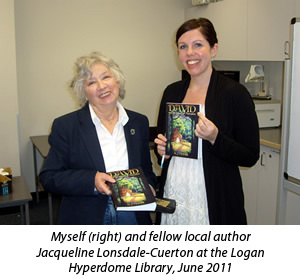 I was lucky enough to be asked to present an author visit at the Logan Hyperdome Library in June 2011 after the release of my first book, ‘David and the Heart of Aurasius’. Once the initial excitement wore off the nerves set in… what on earth was I going to talk about for 90 minutes? Hmm, as it turned out, a LOT! The presentation went well over time, and in the end we had to leave the room for the sewing circle ladies! It was a great morning with lots of questions about self-publishing and marketing, and of course, writing in general. Most attendees were writers themselves, with a few avid readers in the mix, which was great to see! I talked about my writing journey from concept to publication, the multiple re-writes of ‘David’, and the frustrating task of finding a publisher. All who attended were enthusiastic and super friendly, which certainly helped with the nerves! The library team were fantastic and made me feel very welcome. All in all it was a lot of fun and I can’t wait to go back again in June 2012, where I’ll be talking about world-building and ‘breaking the rules’ of writing… stay tuned for more info!